Correspondent|The Nelson Chamisa-led MDC Alliance has recalled Chegutu’s elected Mayor Henry Muchatibaya from Council and also expelled the same from the party, as more and more elected officials continue to lose positions in a scale unprecedented for the opposition movement. 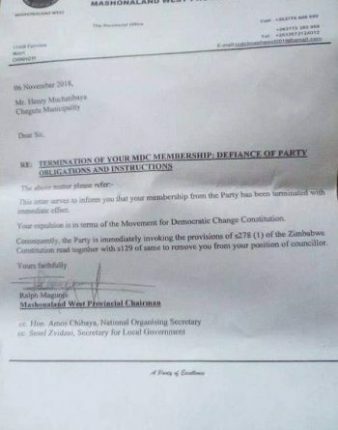 “Your membership from the party has been terminated with immediate effect. Your expulsion is in terms of the Movement for Democratic Change Constitution,” the expulsion letter says, without quoting which section of the party constitution the Mayor violated. The firing from council and expulsion from the party of Muchatibaya follows hard on the heels of similar scenario in Victoria Falls, Bulawayo as well as Masvingo town councils where the MDC leadership has fired and/or recalled elected Mayors or deputy Mayors. “Many people are saying Chamisa is a dictator; he is this and that, what have I done. I’m not a dictator, I am not confused either and I am such a sweet guy who deserves all the good things,” Chamisa has said.